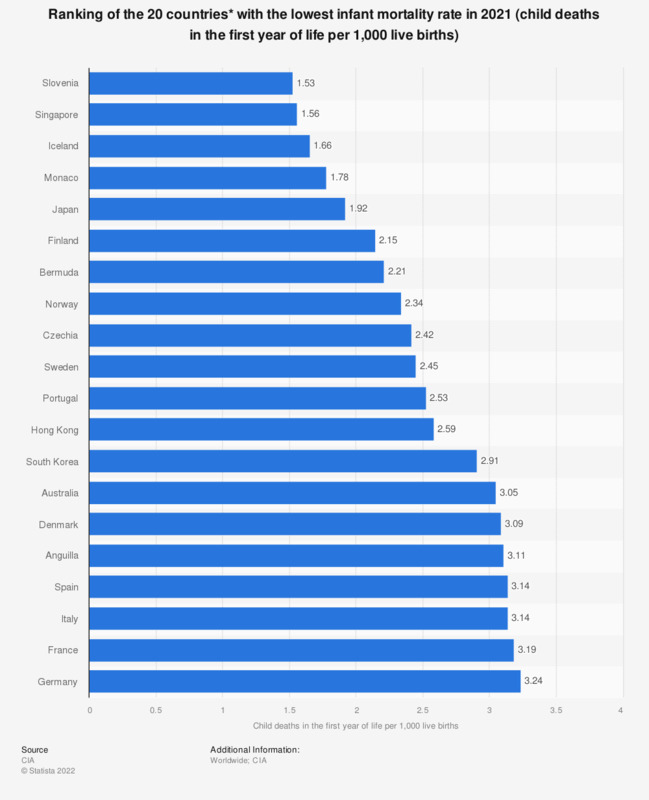 This statistic shows the 20 countries * with the lowest infant mortality rate in 2017. Estimated 1.8 out of 1,000 live births died in the first year of life in Monaco in 2017. Infant mortality rates are often used as an indicator of the health and well-being of a nation. Monaco, Iceland and Japan are among the top three countries with the lowest infant mortality rates with around 2 infant deaths per 1,000 infants within their first year of life. Generally, the countries with the lowest infant mortality also have some of the highest average life expectancy figures. Additionally, the countries with the highest density of physicians and doctors also generally report low infant mortality. Yet, many different factors contribute to differing rates, including the overall income of a country, health spending per capita, a mother’s level of education, environmental conditions and medical infrastructure, to name a few. This creates a lot of variation concerning the level of childbirth and infant care around the world. The countries with the highest rates of infant mortality include Afghanistan, Mali and Somalia. These countries experience around 100 infant deaths per 1,000 infants in their first year of life. While the reasons for high rates of infant mortality are numerous, the leading causes of death for children under the year of five around the world are Pneumonia, Diarrhea and Prematurity. According to the source, all values are estimates.